Hola! Today I will be throwing a giveaway in conjunction with a yummy dish I prepared few weeks ago. Though I am no Jamie Oliver (but I am a big fan and have a collection of his recipe books already) I still try create yummy dishes at home for my family to eat. My recent dish was a success so I thought a giveaway is in order to celebrate haha! I've picked out several items to match with a really cute recipe planner. I call this the recipe planner kit, it's filled with the basic things to get you started with making your own recipes at home. One lucky reader will win this cute set from me. 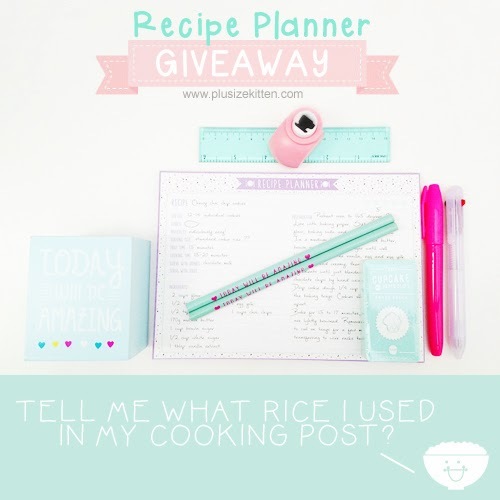 Just register for my giveaway below using rafflecopter and tell me what rice I used in a mystery cooking post teehee! Jasmine rice!! :D cant wait to try your cooking one day! You use Jasmine rice and the recipe seem easy to follow. commented on the other post.. i like ur giveaway la no need to join / like / follow a gabazzillion things..
Jasmine rice~ wait for my turn to cook it! Owh..i commented on ur fb post. Hahaaha..